A clown, a wedding couple and a collie dog are among the finalists in a competition for works of art made out of hay bales. 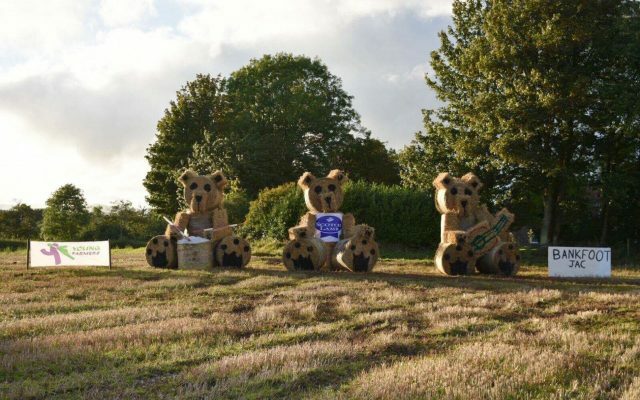 The shortlist for the Young Farmers' Bale Art Competition has been announced, with six now in the running to take the top prize. More than 50 entries were received with other themes including trains, tractors, Scottish brands and the Queensferry Crossing. Suzie Dunn, Scottish Association of Young Farmers Clubs (SAYFC) chairman, said: "Well done to the finalist clubs and to all those club members throughout Scotland who took part this year - a fantastic effort producing over 50 entries." The finalist clubs are Thornhill Young Farmers from Dumfries and Galloway district, West Renfrewshire Young Farmers from Clyde and Central district, Crossroads Young Farmers from Ayrshire district, Vale of Alford JAC from West Aberdeenshire district, Strathearn JAC from Perthshire district and Bankfoot JAC of Perthshire district. 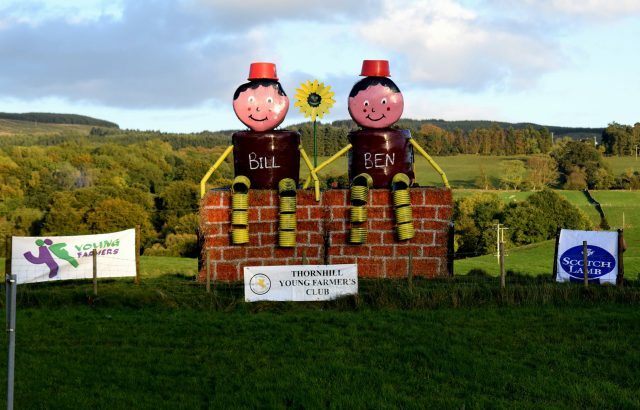 Among the shortlisted entrants are a number of artworks ranging from a collie dog, a bear and a selection of farm animals to Bill and Ben, a clown and a bride and groom. SAYFC members were challenged to include the Scotch Lamb PGI logo in their pieces to coincide with a push by Quality Meat Scotland to raise awareness of the brand. TV presenter Lorraine Kelly is now set to judge the finalists and select a winner. She said: "This is a brilliant initiative by Scotland's young farmers and Quality Meat Scotland and I'm really looking forward to seeing the six finalist bale art entries." Competition organisers have urged people to donate to STV Children's Appeal through a JustGiving page. Millions of undocumented immigrants cross the US-Mexico border illegally every year, and one tour firm is cashing in it by offering tourists in the town of El Alberto an 'illegal' experience, complete with cuts and bruises. Caminata Nocturna offers thrill-seeking holidaymakers the chance to act as migrants and attempt to cross the border during a four-hour night trek, while evading immigration officials and border patrol agents. Interested? You'll have to climb under fences, dodge low-hanging trees and hit the ground when you see a flashlight. Not one for the fainthearted, Exotissimo's half-day Bizarre Bangkok Tour takes in the darker, lesser-known sites of the colourful Thai capital, with a visit to the Forensic Medicine Museum to hear about the country's most notorious serial killer and a trip to the Bangkok Corrections Museum to check out the old torture methods and towers that contained prisoners. The tour also includes a short journey to a fertility shrine devoted to the Goddess Tuptim. Forget sticking pins in dolls and evil zombies. Real-life voodoo is about communicating with thousands of spirits through ceremonial dances, rituals for magical protection and associating colours, food and plants to specific spirits. Voodoo is the indigenous religion of West African countries such as Benin, Togo and Burkina Faso and with G Adventures you can enter the intriguing world by going into the hills, forests and villages on a Voodoo Trail. You'll meet African royalty and witness tribal dancers fall into trance-like states, as well as enjoy an authentic cultural experience like no other. The Chernobyl disaster in April 1986 at the Chernobyl Nuclear Power Plant in Ukraine is considered the worst nuclear power plant accident in history. Today you can visit the eerie ghost town of Chernobyl with Regent Holidays. The Kiev & Chernobyl Group Tour offers a unique insight into one of the most devastating environmental disasters in human history. You'll spend two days exploring the Nuclear Power Plant Exclusion Zone and stay in the small Chernobyl Hotel, which was constructed to house foreign scientists and experts working in the area after the disaster. Love a Hollywood scandal? Or story about a celebrity death? Viator's Dearly Departed: The Tragic History Tour of Los Angeles is the perfect tour for you. Take a revealing ride through the seedy underbelly of the city of angels, where you'll be escorted to infamous. See where Michael Jackson took his last breath and River Phoenix died, as well at the place where Sharon Tate had her last supper. You'll even be treated to a visit to the toilet where George Michael was once arrested. Are you a bit of a daredevil and a gourmet traveller too? Head for Thailand and experience Aleenta Hua Hin-Pranburi Resort and Spa's Gourmet Gliders retreat for culinary explorations and a pulse-quickening pleasure-flight over picturesque Pranburi. The three-day tour includes picking up fresh produce and learning to cook traditional Thai dishes before gliding over the stunning beaches and rolling farms in a paramotor. The pilot will swoop down for a look at the local fishermen's local catch and you'll have an exciting tour around the bay. If you're not sure whether your stomach can take flying over Thailand in the powered paraglider after lunch, you may want to opt for something light! If you have a strange obsession with ancient toilets or just fancy a look at a few old loos, York Walk offers a Historic Toilet Tour in the walled city, taking in the history of the public toilet. The tour features a stroll across Lendal Bridge and Exhibition Square, and you'll learn about Viking toilets, medieval garderobes and Roman facilities. York Walk says you'll have "the opportunity to sample the dubious comforts of medieval garderobes" too but we'd recommend going before the tour! You've heard of Mexican holiday the Day of the Dead when family and friends gather to remember loved ones who have died, right? Well how do you fancy joining the celebrations and honouring the deceased by building altars using sugar skulls and marigolds and being part of an all-night vigil with drinking and storytelling? Houdini's Muse offers a Day of the Dead tour including visits to cemeteries with a local guide who will explain the rituals so you can join in the celebrations. The tour includes a stay at the stylish Hotel Azur in Oaxaca. A tunnel tour might sound pretty dull, but the G-can tour in Tokyo is not just any tunnel tour. The network of tunnels is over four miles long and is engineered to keep Tokyo dry during the rainy season in case of floods. The futuristic-looking network features seventy-eight super-powered pumps and massive tanks, including one giant metal fish bowl measuring 25m x 177m x 78m and 59 enormous pillars. InsideJapan Tours organises tours of Tokyo's G-can flood surge tunnels in English.